Stereo-Step-Eclipse (SSE) technology is designed for autostereoscopic display of multi-angle stereo content for any number of freely located viewers. 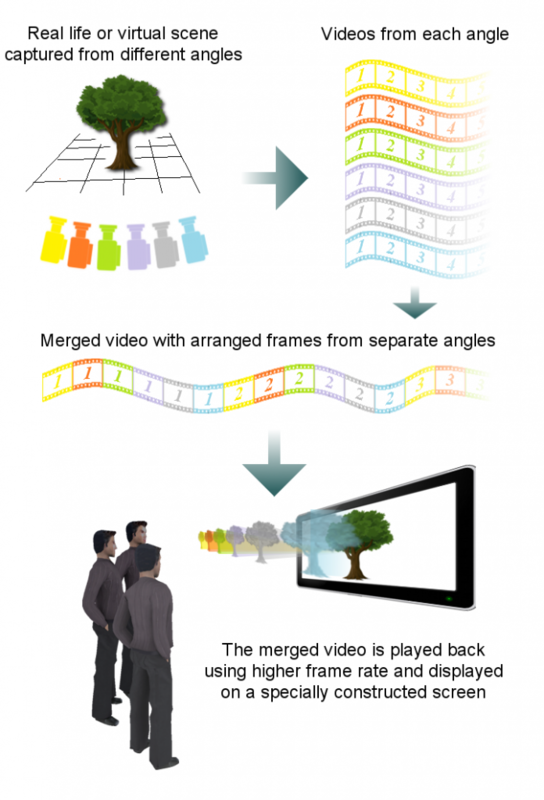 There are no logical differences between 3D and conventional 2D video sequence: SSE video stream consists of separate sets of frames (images/frames). Each frame represents a certain perspective of a scene. In each such set the synchronous perspectives of the same scene are displayed in uniform manner (by quantity and order), and each next set of the video stream corresponds to the following/next moment of the same scene, or is a set of perspectives of the next (new) scene. Original frames of the scene are obtained by taking a picture (using a camera/video recorder) or generated using computer graphics/video editors. Hybrid content is also allowed, which contains both frames obtained by physically taking picture and frames generated using a computer. Positions for real or generated imagery are chosen so that parallax between perspectives would be the same. Generally, the original (obtained by taking picture/video or generated) content is processed on a computer in accordance with a script, instructions of a film director or video format requirements. After this processing, the content is considered ready for broadcasting on existing networks (cable, radio broadcasting) and for direct display (demonstration) on the screen. The final content is transferred to storage media. How the technology works. Click to zoom. The Stereo-Step-Eclipse technology works in the following way. Multiple cameras are capturing the scene from different angles. The cameras have fixed position in respect to each other. In real life scenario, view angle between two or more cameras can be arranged using software. Final frame from the 1st camera, final frame from the 2nd camera, …, final frame from the last camera. The resulting video is played back using correspondingly higher frame rate (6 times higher speed for the six camera configuration) and displayed on a specially constructed screen. Note that there is third-party software available for rapid synthesis of multi-perspective images using two (or more) reference frames. This refers to the interpolation of intermediate perspectives and, partially, to extrapolation, i. e. expansion of overview area of the scene outside of reference images. These software tools, in principle, allow the use of already available hardware for creation of SSE content, i. e. for creating / capturing stereo pairs (using special 2-lenses photo and video cameras, produced by several manufacturers). Obviously, these tools will significantly reduce costs of SSE content synthesis, as well as will allow simpler adaptation of prepared two or more perspective use in SSE. This applies both to existing stocks of dual perspective images (for example, stereo pairs of images of famous sculptures and compositions from museums, architectural and interior scenes, stereo portraits of historical figures, etc.) and dual perspective (filmed or generated) sources of known stereo movies and video records created to be watched using special glasses, as well as a large amount of games and accumulated stereo content to be used for entertainment and for scientific and educational purposes. A viewer standing in different positions sees frame sequences corresponding to a specific shooting angle. If the user is in optimal viewing position, then each eye receives separate views and the user sees the scene in 3 dimensions. If the viewer increases the distance to the screen, then only one view will be seen for both eyes, but from different angles to the screen, different views will be visible. If the user goes near by the screen, both eyes will see different views and bigger parallax effect will perceived. Conventional 2D screen shows different views from corresponding angles in series. The SSE system directs each view into a separate narrow field of observation. A viewer sees different views from different positions. Each eye registers a different view and the viewer sees the scene in 3D. The image below shows a simplified schema of the SSE system. You may also be interested in the scientific background of the SSE technology. Copyright © 2015 - 2018 3D Tau.